This document describes a core ontology for organizational structures, aimed at supporting linked data publishing of organizational information across a number of domains. It is designed to allow domain-specific extensions to add classification of organizations and roles, as well as extensions to support neighbouring information such as organizational activities. This ontology was originally developed and published outside of W3C, but has been extended and further developed within the Government Linked Data Working Group. This document was published by the Government Linked Data Working Group as a Proposed Recommendation. This document is intended to become a W3C Recommendation. The W3C Membership and other interested parties are invited to review the document and send comments to public-gld-comments@w3.org (subscribe, archives) through 12 January 2014. Advisory Committee Representatives should consult their WBS questionnaires. Note that substantive technical comments were expected during the Last Call review period that ended 08 April 2013. 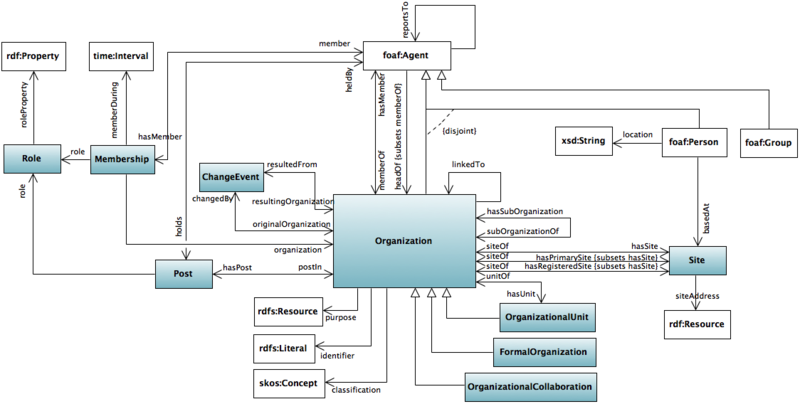 This document describes a core ontology (ORG) for organizational structures, aimed at supporting linked data publishing of organizational information across a number of domains. It is designed to allow domain-specific extensions to add classification of organizations and roles, as well as extensions to support neighbouring information such as organizational activities. This document does not prescribe any particular method of deploying data expressed in ORG. ORG is applicable in many contexts including RDF accessible via SPARQL endpoints, embedded in HTML pages, or serialized as an RDF/XML or Turtle. The examples in this document use Turtle [ turtle ] in the interests of readability. This coverage corresponds to the type of information typically found in organizational charts. As such it does not offer a complete representation for all the nuances of organizational control structures and flows of accountability and empowerment. Developers are encouraged to create extension vocabularies for such purposes, building upon this generic foundation. The ontology does not provide category structures for organization type, organization purpose or roles. Different domains will have different requirements for classification of such concepts. Instead the ontology provides just the core base concepts needed to allow extensions to add specific sub-class structures or classification schemes as required. Users of the ontology are encouraged to define profiles which strengthen interoperability by specifying particular controlled vocabularies to use for these concepts. A pictorial illustration of the main classes and relationships in ORG is shown below. All terms are within the ORG namespace (http://www.w3.org/ns/org#, preferred prefix org:) unless an explicit prefix is given. The namespaces for all referenced vocabularies are giving in the section on Namespaces. The core class in the ontology is org:Organization which is intended to be applicable to a very broad range of organizations. It represents a collection of people organized together into a community or other social, commercial or political structure. The group has some common purpose or reason for existence which goes beyond the set of people belonging to it. An organization may itself be able to act as an agent. We distinguish a particular sub-class of organization org:FormalOrganization to indicate organizations that are recognized in the world at large, in particular in legal jurisdictions, with associated rights and responsibilities. Examples include a corporation, charity, government or church. The ontology then supports the notion of organizations being composed of other organizations in some hierarchy. The relations org:subOrganizationOf and org:hasSubOrganization establish these hierarchical links. In some cases the sub-organization can be regarded as standalone - for example a legally recognized business may be part of a larger group or holding company. In other cases it is useful to refer to departments or organizational units such as the IT department which only have meaning within the context of the containing organization. The ontology supports that situation through a specialization of org:Organization called org:OrganizationalUnit. For convenience it also provides the relations org:hasUnit and org:unitOf which are specializations of the generic sub-organization links. Note that the containment hierarchy is completely open. For example, org:FormalOrganizations are free to contain other org:FormalOrganizations. Such hierarchies are specific to the particular organization, or class of organization being modelled. Profiles of ORG may include sub-classes of org:Organization and org:OrganizationalUnit to represent such structures and specialize or restrict the use of org:hasSubOrganization to match the desired hierarchy. In a number of circumstances we wish to classify organizations. There are many approaches that could be taken for this. It can be based on the legal structure under which the organization operates. For example in UK legislation there are defined notions of Partnership, Limited Company etc that can be used as a basis for classification. Alternatively organizations can be classified by the service they provide (e.g. educational, manufacturing, legal service etc). ORG is neutral with respect to such choices. It is anticipated that profiles will either introduce sub-classes of org:Organization or define a classification scheme for organizations. To support the latter the ontology supplies a property org:classification which can be used the classify an organization using a SKOS [ SKOS-REFERENCE ] concept scheme. Which of these mechanisms to use depends on the situation. If the classification is not intrinsic to the organization but simply some way to group organizations, for example as part of a directory, then org:classification should be used. If the classification is a reflection of the intrinsic nature of the organization and affects other properties then the sub-class approach should be used. For example, only charities have charity numbers so it would be better to represent a charity as a sub-class of org:FormalOrganization rather than via a taxonomic labelling. ORG provides a number of ways to represent the relationship between people and organizations, together with the internal reporting structure of an organization. Experience with early versions of the ontology demonstrated that there is no "one size that fits all". In some cases a very simple direct representation is preferred for ease of consumption. In other cases a more complex representation is needed to capture the nuances of the situation. An ORG profile may specify that a particular subset of these mechanisms be used. This simplest representation provided by ORG is to directly state that some individual (represented as a foaf:Agent) is org:memberOf an organization. To represent specific roles that the person plays, ORG profiles may define sub-properties of org:memberOf. In particular, the notion of a leader or head of a organization is so common that ORG provides a built in property specialization of org:memberOf, namely org:headOf for this purpose. However, in general it is advantageous to have an explicit representation of the organizational role that the person fulfils (e.g. for publication of responsibilities associated with the role). This is supported by the org:Role class. The situation of an Agent fulfilling that role within an organization is then expressed through instances of the org:Membership n-ary relationship. This also makes it possible to annotate the relationship with qualifying information such as duration, salary, reference to the employment contract and so forth. Tool chains may generate org:Membership instances and then apply this closure rule to add any corresponding short-cut specializations of org:memberOf. The third representation that is provided by ORG is that of a org:Post which represents some position in the organization that may or may not be currently filled. Posts enable reporting structures and organization charts to be represented independently of the individuals holding those posts. Posts can report to other Posts. So a org:Post can exist without someone holding that post. In contrast, a org:Membership represents the relationship between a particular individual (Agent) and the organization and does not exist unless there is an Agent to partake of the relationship. While commonly a Post would be held by a single person there are situations in government organizations where a Post may itself be, or be treated as, an Organization. There are no disjointness constraints precluding an application of ORG from treating an entity as both a org:Post and an org:Organization simultaneously, if that is an appropriate modelling of the situation. A post can have an associated org:Role. In many situations only one of Post or Membership is needed, and ORG profiles may specify that use of one of the two is preferred. In cases where the structure of the organization is to be given, independently of the people within that structure, then org:Post is the appropriate representation to choose. In cases where the aim is to record the people who make up the organization and those memberships are likely to be annotated (e.g. with duration of the membership) then org:Membership is appropriate. ORG provides org:Site to represent locations at which organizations exist. The relations org:siteOf and org:hasSite establish links between a org:Site and an organization. We distinguish a primary site (org:hasPrimarySite) to indicate the default means by which an organization can be contacted, and a registered site (org:hasRegisteredSite) to indicate a legally registered site for the organization. The ontology provides org:siteAddress to define the address of a site using a vocabulary such as the vCard [ vcard-rdf ] vocabulary. Any aspect of organizational structure is subject to change over time. For the most part this should be handled by an external mechanism such as named graphs. When Organizations change substantially (not simply a change of personnel or internal structure), for example a merger to create a new organization, then the new Organization will typically be denoted by a new URI. In that case we need some vocabulary to describe that change over time and the relationship between the original and resulting resources. ORG provides org:ChangeEvent and associated properties as a foundation for this, building upon the PROV-O Provenance Vocabulary [ prov-o ]. An application can use terms from the PROV-O vocabulary to further describe the change event, for example the period of time over which it occurred. Such usage of PROV-O terms should take into account the semantic constraints [ prov-constraints ] of the PROV model. In earlier versions of this ontology the OPMV Provenance Vocabulary was used. We believe that the PROV-O terms used here are equivalent to the corresponding OPMV terms previously used and that this change does not affect the semantics of the ontology. Use of inverses: designers differ on whether providing pairs of inverse relationships between concepts is good practice compared to declaring each relationship in just one direction. In this design we provide inverses for most relations (omitting attribute-like relations). This makes it easier to query the data in linked data settings where a (non-symmetric) closed bounded description is often the default description of each resource. This does incur a cost in terms of maintenance of those relationships. Particular applications of the ontology may adopt a profile in which only certain directions are asserted in the data and leave it up to clients to apply any inverseOf reasoning they require. Naming: some designers prefer to name properties by nouns which describe the object of the property, others prefer to treat property names as names of the link and use a pattern to indicate the direction of the link. Here we adopt the latter approach for those properties which are relational and especially when the direction is ambiguous. We use the URI pattern org:hasFoo/org:fooOf for this but simplify the labels to "foo" and "foo of" to improve readability in linked data viewers. it does not use terms from other vocabularies instead of ones defined in this vocabulary that could reasonably be used (use of such terms in addition to ORG terms is permissible). may use only a subset of ORG terms. guidance on choice of modelling approach for roles (see Membership and Reporting structure). The namespace for ORG is http://www.w3.org/ns/org#. However, it should be noted that ORG extends and uses terms from other vocabularies. A full set of alphabetically ordered namespaces and prefixes used in this document is shown in the table below. Represents a collection of people organized together into a community or other social, commercial or political structure. The group has some common purpose or reason for existence which goes beyond the set of people belonging to it and can act as an Agent. Organizations are often decomposable into hierarchical structures. Usage note: It is recommended that SKOS lexical labels should be used to label the Organization. In particular skos:prefLabel for the primary (e.g. legally recognized name), skos:altLabel for alternative names (trading names, colloquial names) and skos:notation to denote codes from a code list. Alternative names: Collective, Body, Group. Represents hierarchical containment of Organizations or OrganizationalUnits; indicates an Organization which contains this Organization. Usage note: Inverse of org:hasSubOrganization. Represents hierarchical containment of Organizations or OrganizationalUnits; indicates an Organization which contains this Organization, directly or indirectly. Usage note: The transitive closure of subOrganizationOf, giving a representation of all organizations that contain this one. Note that technically this is a super property of the transitive closure so it could contain additional assertions but such usage is discouraged. Represents hierarchical containment of Organizations or OrganizationalUnits; indicates an organization which is a sub-part or child of this organization. Usage note: Inverse of org:subOrganizationOf. Indicates the purpose of this Organization. There can be many purposes at different levels of abstraction but the nature of an organization is to have a reason for existence and this property is a means to document that reason. An Organization may have multiple purposes. Usage note: It is recommended that the purpose be denoted by a controlled term or code list, ideally a skos:Concept. However, the range is left open to allow for other types of descriptive schemes. It is expected that profiles of this vocabulary will constrain the range of org:purpose. Alternative names: remit, responsibility (esp. if applied to OrganizationalUnits such as Government Departments). Indicates a classification for this Organization within some classification scheme. Note that it also permissible for applications to define sub-classes of org:Organization as a means to represent organizational categories. Gives an identifier, such as a company registration number, that can be used to used to uniquely identify the organization. Usage note: Many different national and international identifier schemes are available from other vocabularies. The ORG ontology is neutral to which schemes are used. The particular identifier scheme should be indicated by the datatype of the identifier value. Using datatypes to distinguish the notation scheme used is consistent with recommended best practice for skos:notation of which this property is a specialization. Indicates an arbitrary relationship between two organizations. Usage note: Specializations of this can be used to, for example, denote funding or supply chain relationships. An Organization which is recognized in the world at large, in particular in legal jurisdictions, with associated rights and responsibilities. Examples include a corporation, charity, government or church. Usage note: Note that this is a super class of gr:BusinessEntity and it is recommended to use the GoodRelations vocabulary to denote Business classifications such as DUNS or NAICS. An Organization such as a department or support unit which is part of some larger Organization and only has full recognition within the context of that Organization. In particular the unit would not be regarded as a legal entity in its own right. Indicates a unit which is part of this Organization, e.g. a Department within a larger Organization. Usage note: Inverse of org:unitOf. Indicates an Organization of which this Unit is a part, e.g. a Department within a larger Organization. Usage note: This is the inverse of org:hasUnit. Indicates that an agent (person or other organization) is a member of the Organization with no indication of the nature of that membership or the role played. Note that the choice of property name is not meant to limit the property to only formal membership arrangements, it is also intended to cover related concepts such as affiliation or other involvement in the organization. Extensions can specialize this relationship to indicate particular roles within the organization or more nuanced relationships to the organization. Indicates an agent (person or other organization) who is a member of the subject Organization. Inverse of org:memberOf, see that property for further clarification. Usage note: Provided for compatibility with foaf:member. Indicates that a person (or other agent) is the leader or formal head of the Organization. Indicates the nature of an Agent's membership of an organization. Usage note: Represents an n-ary relationship between an Agent, an Organization and a Role. It is possible to directly indicate membership, independent of the specific Role, through use of the org:memberOf property. Indicates the Person (or other Agent including Organization) involved in the Membership relationship. Indicates the organization in which the Agent is a member. Indicates the Role that the Agent plays in a Membership relationship with an Organization. Can also be used on a org:Post to indicate the role that any holder of the Post plays. Indicates a membership relationship that the Agent plays. Usage note: Inverse of org:member. Optional property to indicate the interval for which the membership is/was valid. Range: Formally the interval representation is left open, however as an informative note the use of time:Interval from [ OWL-TIME ] is suggested. Denotes a role that a Person or other Agent can take in an organization. Instances of this class describe the abstract role; to denote a specific instance of a person playing that role in a specific organization use an instance of org:Membership. Usage note: It is common for roles to be arranged in some taxonomic structure and we use SKOS to represent that. The normal SKOS lexical properties should be used when labelling the Role. Additional descriptive properties for the Role, such as a Salary band, may be added by extension vocabularies. This is a metalevel property which is used to annotate a org:Role instance with a sub-property of org:memberOf that can be used to directly indicate the role for ease of query. Indicates a salary or other reward associated with the role. Usage note: Typically this will be denoted using an existing representation scheme such as gr:PriceSpecification but the range is left open to allow applications to specialize it (e.g. to remunerationInGBP). A Post represents some position within an organization that exists independently of the person or persons filling it. Posts may be used to represent situations where a person is a member of an organization ex officio (for example the Secretary of State for Scotland is part of UK Cabinet by virtue of being Secretary of State for Scotland, not as an individual person). A post can be held by multiple people and hence can be treated as a organization in its own right. Indicates a Post held by some Agent. Usage note: Inverse of org:heldBy. Indicates an Agent which holds a Post. Usage note: Inverse of org:holds. Indicates the Organization in which the Post exists. Usage note: Inverse of org:hasPost. Indicates a Post which exists within the Organization. Usage note: Inverse of org:postIn. Indicates a reporting relationship as might be depicted on an organizational chart. It can be used to indicate a reporting relationship directly between Agents or between Posts that Agents could hold. Usage note: The precise semantics of the reporting relationship will vary by organization but is intended to encompass both direct supervisory relationships (e.g. carrying objective and salary setting authority) and more general reporting or accountability relationships (e.g. so called dotted line reporting). An office or other premise at which the organization is located. Many organizations are spread across multiple sites and many sites will host multiple locations. Usage note: In most cases a Site will be a physical location. However, we don't exclude the possibility of non-physical sites such as a virtual office with an associated post box and phone reception service. Extensions may provide sub-classes to denote particular types of site. Indicates an addess for the site in a suitable encoding. Use of a well known address encoding such as the vCard [ vcard-rdf ] vocabulary is encouraged but the range is left open to allow other encodings to be used. The address may include email, telephone, and geo-location information and is not restricted to a physical address. Indicates a site at which the Organization has some presence even if only indirect (e.g. virtual office or a professional service which is acting as the registered address for a company). Indicates an Organization which has some presence at the given site. Indicates a primary site for the Organization, this is the default means by which an Organization can be contacted and is not necessarily the formal headquarters. Indicates the legally registered site for the organization, in many legal jurisdictions there is a requirement that FormalOrganizations such as Companies or Charities have such a primary designed site. Indicates the site at which a person is based. We do not restrict the possibility that a person is based at multiple sites. Gives a location description for a person within the organization, for example a Mail Stop for internal posting purposes. A collaboration between two or more Organizations such as a project. It meets the criteria for being an Organization in that it has an identity and defining purpose independent of its particular members but is neither a formally recognized legal entity nor a sub-unit within some larger organization. Might typically have a shorter lifetime than the Organizations within it, but not necessarily. Represents an event which resulted in a major change to an organization such as a merger or complete restructuring. It is intended for situations where the resulting organization is sufficiently distinct from the original organizations that it has a distinct identity and distinct URI. Usage note: Extension vocabularies should define sub-classes of this to denote particular categories of event. The time period over which the event occurred should be expressed using prov:startedAtTime and prov:endedAtTime. A textual description of the event may be given by dct:description. Indicates one or more organizations that existed before the change event. Depending on the event they may or may not have continued to exist after the event. Indicates a change event which resulted in a change to this organization. Usage note: Depending on the event the organization may or may not have continued to exist after the event. Indicates an event which resulted in (led to, generated) this organization. Indicates an organization which was created or changed as a result of the event. The range of org:memberDuring has been made unconstrained. Use of time:Interval is still suggested but is not a normative requirement and so the referenece to [ OWL-TIME ] is now informative. The reference to foaf has been made normative to reflect its usage in the definitions of several ORG terms. Changed reference to Turtle specification to be non-normative, it is only used in non-normative examples. Updated the diagram in section 1 to a clearer, more complete version, thanks to João Paulo Almeida. Added namespace and links to vocabulary file to the Abstract for ease of reference. Duplicated the index of vocabulary terms earlier in the document for ease of reference. Removed CR specific text on implementation feedback and At Risk features. Added explicit declarations that org:member and org:organization are functional properties. This is a clarification rather than an intended change of semantics. Removed assertion that org:Post is a sub class of org:Organization, adding an informative note that ORG applications are still free to declare entities as being instances of both classes. Added property chain axiom for prov:wasDerivedFrom. Removed the range constraint on org:siteAddress to allow other encodings than VCard to be used. Added a statement that org:Organization is equivalent to the foaf:Organization class. This statement was present in the ontology itself at the time of last call but not sufficiently clear in this document. Removed informative comment that the org:reportsTo graph is acyclic, this is not necessarily the case. Changed document title to use title case and definite article. Updated the references to PROV-O and Turtle. Marked the terms in Section 5.6 Historical Information as At Risk. Marked the normative use of OWL Time as At Risk. Modified org:ChangeEvent, org:originalOrganization and org:resultedFrom to extend the PROV-O vocabulary instead of OPMV. Added org:Post and associated properties. Corrected description of org:hasSubOrganization and org:subOrganizationOf. Corrected domain of org:remuneration to match ontology. Corrected domain/range of org:hasMember to match ontology. Added missing entry for org:memberOf to match ontology. Rephrasing and restructuring throughout the document to improve clarity. Added org:identifier to support generic use of organization identifier schemes, including local and national schemes. Added org:changedBy and org:resultingOrganization as inverses to the OMPV compatible properties and added a note on use of inverses. Rephrased the introduction to clarify scoping of the ontology. Made org:Organization equivalent to foaf:Organization following clarifying discussions with Dan Brickley. Added org:hasMember as an inverse of org:memberOf in order to be able to declare the equivalent to foaf:member, thanks to Dan Brickley for the suggestion. Made org:unitOf/org:hasUnit sub properties of org:subOrganizationOf/org:hasSubOrganization, thanks to Dave Challis for prompting this clarification. Added org:transitiveSubOrganizationOf, thanks to Damian Steer for the suggestion. Fixed range statements for org:role and org:organization to correspond to the documentation and intent, thanks to Bernard Vatant for spotting that problem. Modified description of org:memberOf to clarify that the notion of membership is very broad and not meant to be limited to formal notions of membership. Clarified the description of org:FormalOrganization. Fixed bug in restriction definition for org:OrganizationalCollaboration, thanks to Start Williams for point out the problem. Reversed org:resultingOrganization to org:resultedFrom for compatibility with OPMV, thanks to Jeni Tennison for pointing out the problem. Changed labels for has* properties to read as nouns, leaving URIs unchanged. Added rdfs:isDefinedBy declarations, thanks to Kingsley Idehen for pointing out the lack of those. Clarified license terms, thanks to Dan Brickley for pointing out the lack. This ontology was originally developed for use by data.gov.uk as part of the UK Linked Data Kernel project under the leadership and guidance of John Sheridan (The National Archives). Jeni Tennison provided immensely useful feedback and suggestions on the first draft, which greatly improved its design. The work also took inspiration from a number of other ontologies, particularly the thoughtfully designed Gazette Organization ontology and Proton-top. The editor gratefully acknowledges comments and support from the Government Linked Data Working Group - particularly to Daniel Vila for transcribing the original documentation into W3C format and to Bart van Leeuwen for feedback and discussions that resulted in the addition of org:Post. The modelling of org:Post is closely based on the work of Jeni Tennison on modelling UK Government.